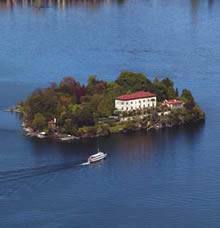 Although Isola Madre (Madre Island) is the largest of the Borromean Islands on Lake Maggiore [also including Isola Bella and Isola dei Pescatori (Bella and Pescatori islands)], it is not inhabited. Its position differs from that of the other Borromean Islands as it is right in the middle of the Gulf of Borromeo, halfway between Baveno and Pallanza, along an imaginary line also crossing the Isolino San Giovanni (Islet of San Giovanni). Its surface area comprises 7.8 hectares and it’s 220 metres wide by 330 metres long. It is mainly occupied by gardens, but there are also buildings here. In ancient times it was dedicated to Saint Victor, then its name was changed to Isola Maggiore and finally it was given its current name. This is one of Italy’s oldest botanical gardens. Its microclimate favours the growth of wistaria, rare sub-tropical plants, exotic flowers and gaudy-coloured birds (it’s common here to see multi-coloured parrots, Chinese pheasants or elegant peacocks with white feathers). All this, combined with the special attention paid to taking care of this environment, leads visitors to believe they are in a tropical place. The area was home to olive groves in the early 16th century, and was later converted into a charming garden. Subsequent interventions resulted in the creation of an English garden extending over a surface area of almost 8 hectares. Further changes resulted in the park’s current appearance: it has several terraces, allowing visitors to stop and admire true rarities such as a two-hundred-year-old Kashmir Cypress and a Jubaeae Spectabilis palm, which will soon have its 125th birthday. As often occurs in English gardens, the layout of the paths doesn’t appear to have been planned in advance as they unwind in an almost random fashion. The building still seen on the island today was built in 1590 on the ruins of a primitive church with cemetery dedicated to San Vittore. It has been furnished according to the times. The well-known Sala delle Bambole (Hall of Dolls), Sala delle Stagioni (Hall of Seasons) and the one dedicated to displaying ancient puppet theatres are worth seeing. In-depth information on Palazzo Borromeo is provided on the following sheet.